I’ve been on a quest for a long time, I’m talking years, to find a pair of flats that would work for me. For many years I gave up trying to find flats and decided to just wear sneakers or boots. One of the main reasons for giving up on flats was due to them never quite fitting my very narrow feet. My heels and ankles are really skinny and narrow. It’s made finding flats that don’t slip or flap off almost impossible. Eventually, I discovered Tieks. They seemed interesting so I gave them a try. Overall, they looked ok, came in a ton of colors, but I had and still have problems with them. Tieks don’t come in half sizes. These are the one pair of shoes I’ve found that I could actually benefit from a half size in. Usually I’m a solid 7 in everything, but their 7 is a bit tight, and an 8 is too loose around the middle of the shoe. Not washable. My feet sweat like crazy in Tieks. I’m assuming it’s because they are so tight and are made of leather. You need to break them in, at least I had to. Some people have had really great luck with Tieks and can wear them out of the box; not me. I’ve had to wear Tieks around my apartment in socks, and then usually stick some big fluffy socks in the toe sections when I’m not wearing them just to give them a little extra wiggle room when they are brand new. They hurt my heels. Yes, I could put bucket this in with item #3 but I felt this needed it’s own callout. I’ve had grooves in the back of my heels and blisters from Tieks. While I do have 4 pairs of Tieks, I was still on a mission to see if there was anything better out there. 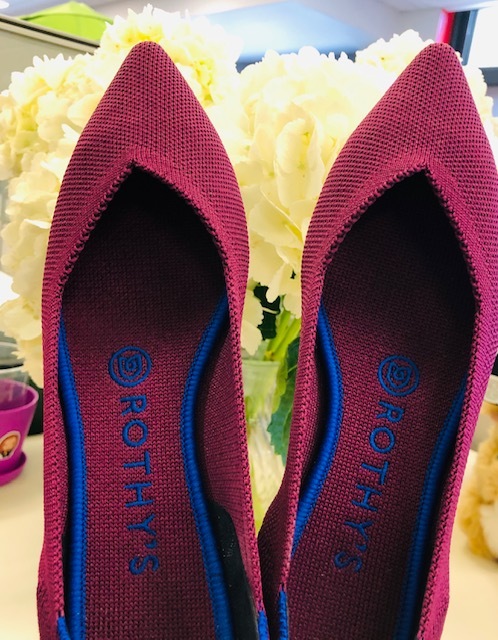 I had seen a number of ads for Rothys and I kept wondering if they were too good to be true. Their price tag, like Tieks, is on the steeper side so I wasn’t sure if it was going to be worth taking the plunge, but their return policy seemed pretty liberal so that was in the back of my mind. Then a couple of months ago, my friend and coworker got a pair and they looked pretty nice. They seemed to work out well for her, and she had no complaints so I figured what do I have left to lose. 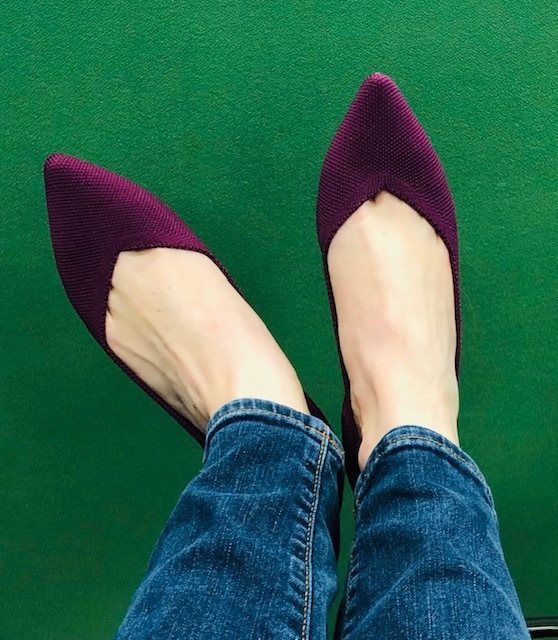 Well, I took the plunge and I bought a pair of “The Point” shoes in Orchid, a beautiful purple. My research on the site showed that the company, and customers, recommended going with the Point version if you have narrow feet. When I pulled mine out of the box, they were literally the most comfortable flats I ever put on my feet. From the first moment I tried them on I literally had no complaints. I leapt and danced through my apartment. Still skeptical though, because in the past flats have felt ok temporarily, but then after a full day wearing them I wish I hadn’t, I decided to bring them to the office. 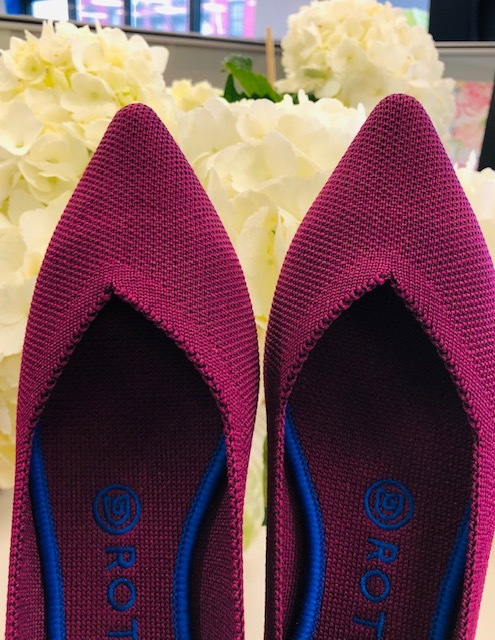 You can return Rothys as long as you haven’t worn them outside and they are still in new condition. I packed them up in my bag and slipped them on when I got to my desk. Here’s what went down. There was no heel slippage. My shoes stayed on my feet successfully. No noticeable pain, although one foot felt a little tight near the toe area on one side. The site suggests sizing up a half size in The Point but I was too nervous so I didn’t. My feet sweated a bit, but I felt the shoe was more breathable than Tieks. No heel pain. None! This is unheard of for me. No heel slippage. There’s a nice heel backing in the shoe that makes things stay in place. Super comfortable! After wearing them for extended periods of time I have no complaints and they do stretch a bit, in a good way. True to size for me, but if you have a wider foot, going up a half size is probably a better idea. Washable! Apparently you can throw these suckers into the washing machine! Removable insert – and you can buy different color ones if you’re into spicing it up a bit. 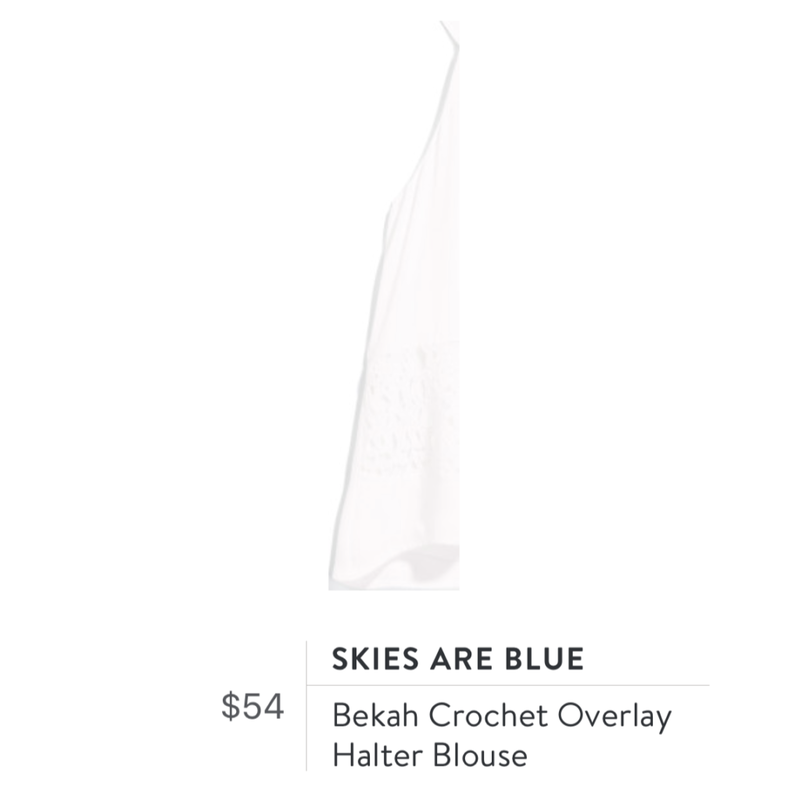 I’m always seeing ads for fashion and stylist services, mostly because the internet knows I’m a big fan of Stitch Fix so it figures I might be interested in some other options. So, when I received an unexpected bonus at work, I decided to splurge (it was right before the holidays) and give one of these other services a try and treat myself. I also wanted to find out if “high fashion” was really better, more fashionable, and if it was worth it. The company I decided to take the leap with was Front Door Fashion. Before selecting them, I did a little research to see what they were all about and if people had good experiences with them. For reference, they were advertised to me on Facebook, which is how I found out about them. They seemed interesting, promising high-end clothing. 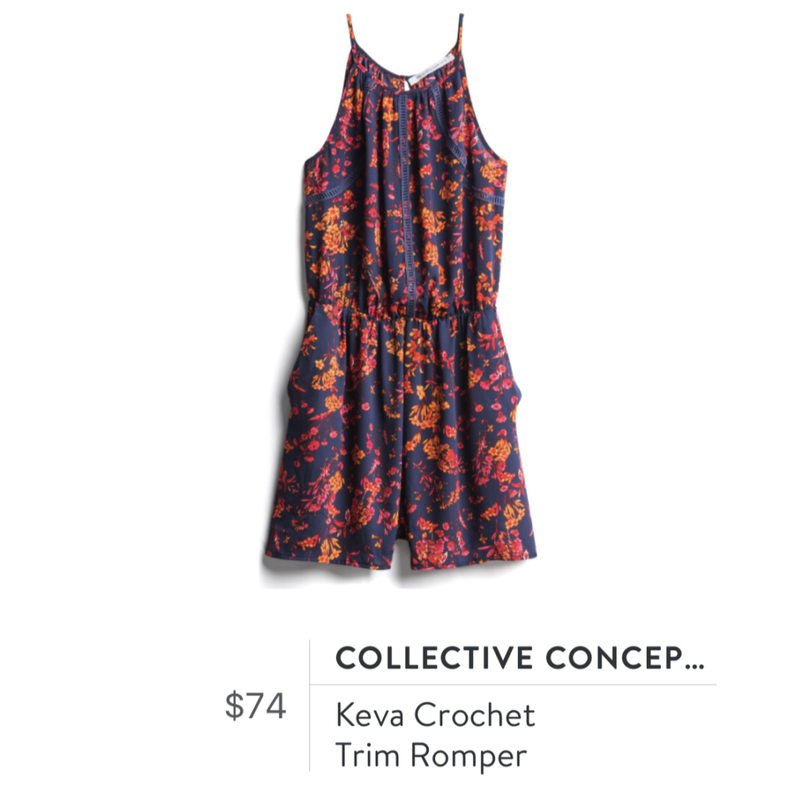 Like Stitch Fix, you take a style quiz but not as visual per se as Stitch Fix. I asked for pieces to be travel friendly and fashion forward, aka I wanted to try some new trends. I remained hesitant for a while if I should bite the bullet, and even completed my profile, got to the schedule a box section, and then backed down. Do I really need more clothes? Should I really be spending this much money? Well, before I knew it, a stylist had been assigned to me after seeing that I completed my profile and wanted to help get a box together for me asap. Now, this wasn’t a simple automated email message coming my way saying schedule your box now, no. In the matter of a day, I believe I was called, texted, and emailed. Whoa. 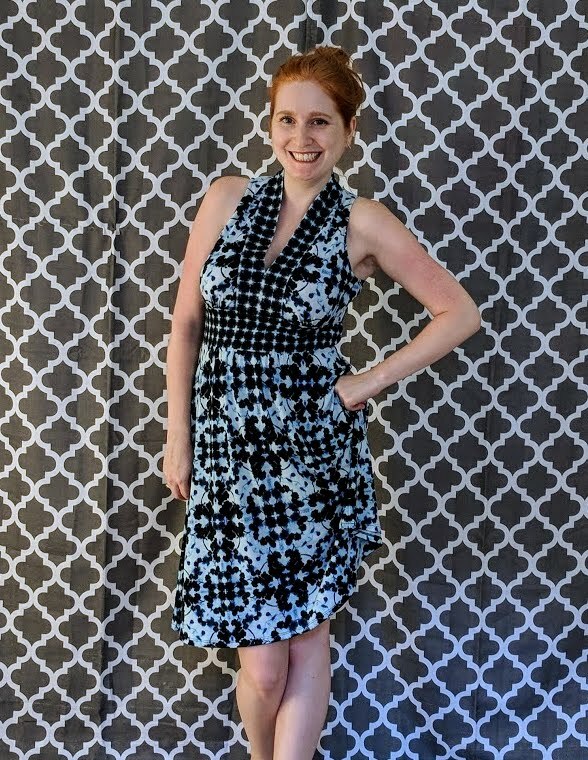 For someone who doesn’t like cold calls I certainly wasn’t going to chat with someone about my fashion personality over the phone, especially when I don’t know how I’d describe my look 🙂 I responded to the email, scheduled a box online and waited. Once I got my box, a couple weeks later, I was given 5 days to try everything on and figure out what worked for me or didn’t. Let’s dig in. A large and heavy box arrived and inside was a massive garment bag, some papers describing the items, and a shoe suggestion card with images of shoes and what items they would look good with (although I received no shoes). Within the garment bag, items were segmented together in batches or outfits/looks. Usually this was done by a little jewelry bag wrapped around hangers. The paper print out also dictated which group of hangers was what. By first look, there was going to be some pieces that were going to be a Big NO for me. One thing that I wish was included was a printout with images of the items, and how they should be paired together. 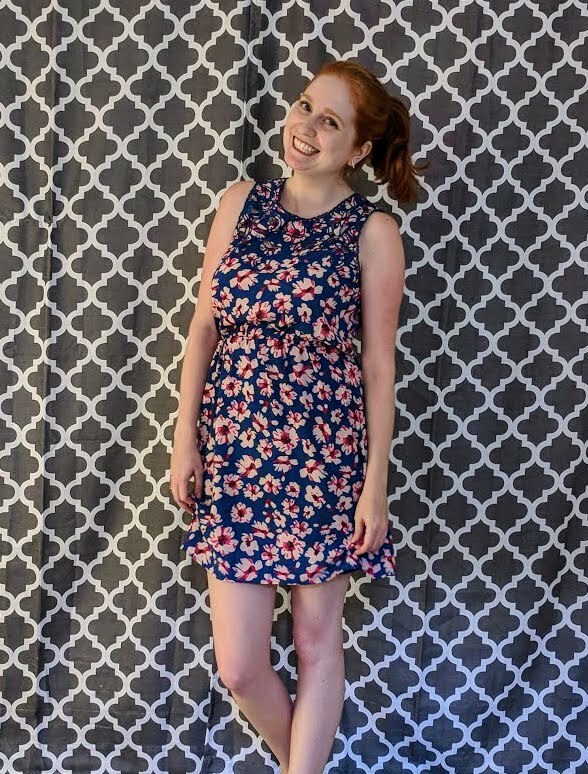 Stitch Fix does a great job with this, although I still wish they’d include pictures with models in the clothing as well so you could see how pieces were supposed to fit and fall on you, but moving on… With FDF, I had to just go off paragraphs on a funny printed sheet to style myself. 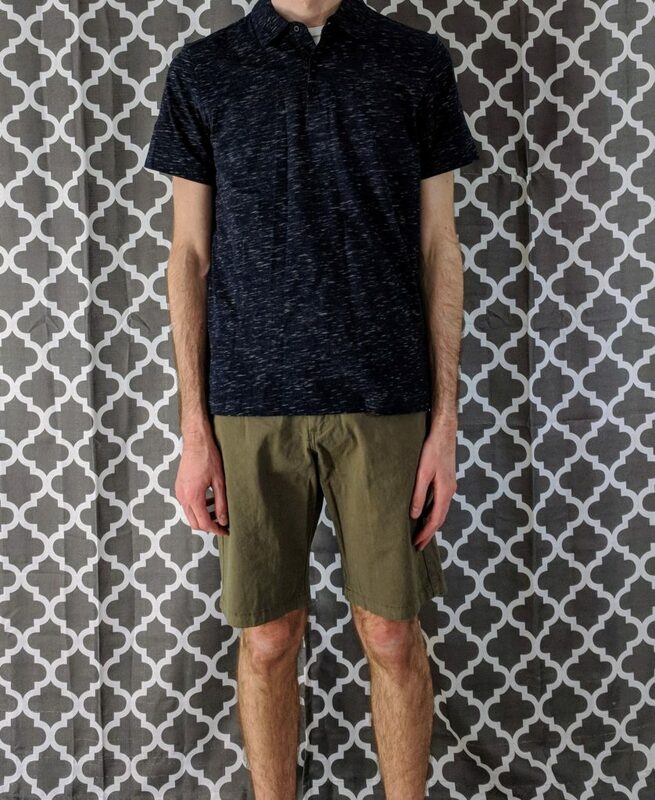 The website also didn’t have any photos of the clothes or outfits, so the only peek you get is from me actually trying on the pieces. The first cluster of clothing items listed under Outfit 1 from my stylist consisted of the following designers, pieces, and prices. The cut of the jean was frayed and unfinished looking in a not good looking kind of way. I also wasn’t sure where on the ankle it was supposed to fit me, so I felt uncomfortable, feeling like I was wearing high waters. 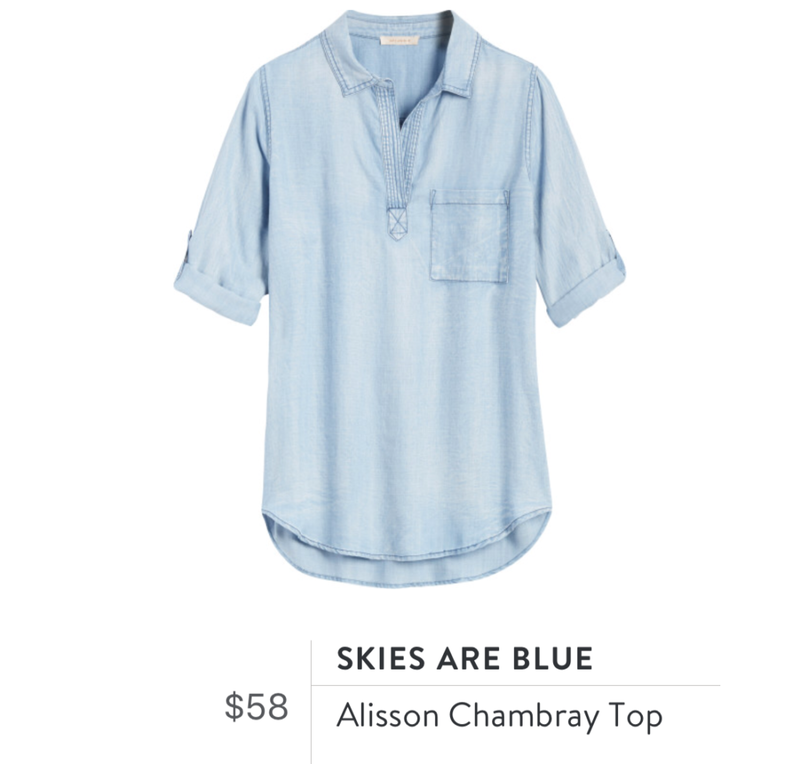 I have a similar color jean already from Stitch Fix so I decided to pass on these for something in my wardrobe that already worked for me. 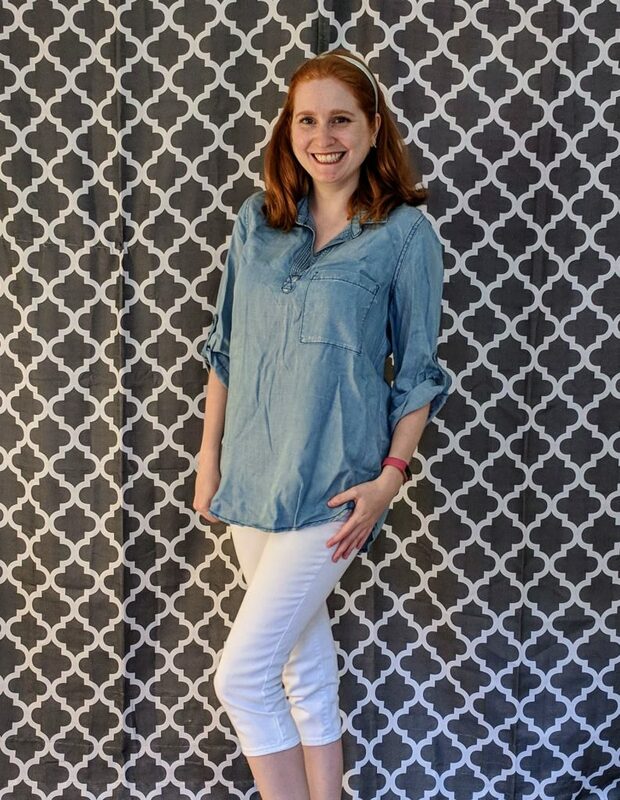 I’m wearing these Articles of Society jeans in the pictures below, but you can’t see the true color (dark purple) or how they cut off on my ankles strangely. 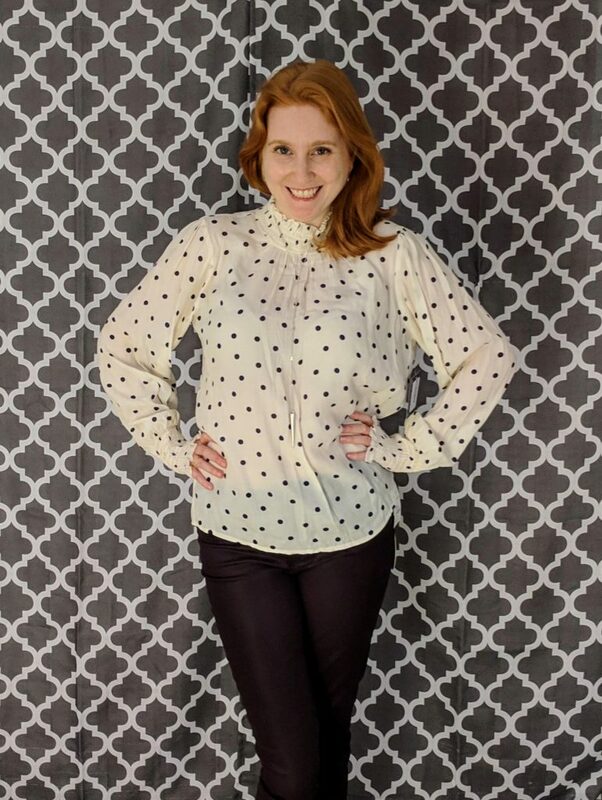 There’s a lot going on with this polka dot blouse. The neckline makes me feel like I’m stepping back in history in England, and the sleeves were a bit too puffy and long on me. Overall, I felt the top made me look larger than I am do to how loose and baggy it was on my frame. Not a keeper. 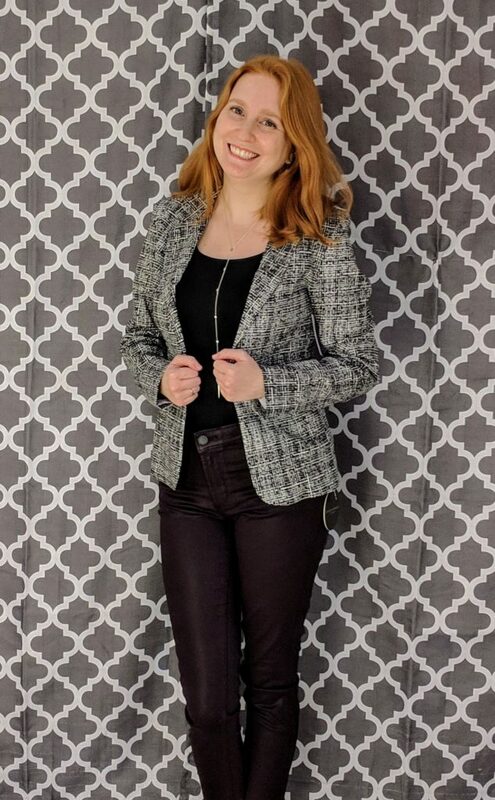 As a former Broadcast Journalist in training, I really like a good blazer and find they’re always a fun item to add to one’s closet. The price of this one really scared me though. I don’t tend to spend this kind of money on myself, ever. The blazer itself is super comfortable and stretchy. It just had a nice feel to it and I figured I was splurging and trying something new, so if I wanted to, I should take the plunge. In the end, I kept this item. A long silver necklace good for plain tops and adding a little something to an outfit. I kept it because I could easily pair it with some items I have and I could use a long necklace every now and then. Nothing too fancy about this item. It was just a long blank tight tank top. I was on the fence but ultimately decided I could probably find a cheaper option if I wanted one like this. Below are the designers, pieces, and prices for this bunch of items. I know a lot of people pay over $100 for jeans, but I’ve never done so. I guess it’s a fairly common item to “invest” in since jeans are very durable and you can wear them for years. I typically get my jeans either from Old Navy, Delia’s or Stitch Fix, and they are never more than $50 or $60, if that. However, these jeans come with a great stretch, they are dark in wash, which is what I wanted, and they aren’t distressed in any way. They fit what I was looking for, and they are comfortable on so I splurged and purchased them. I didn’t expected to find a vest in my box, but apparently they must be in with the high-end fashion crowd too. 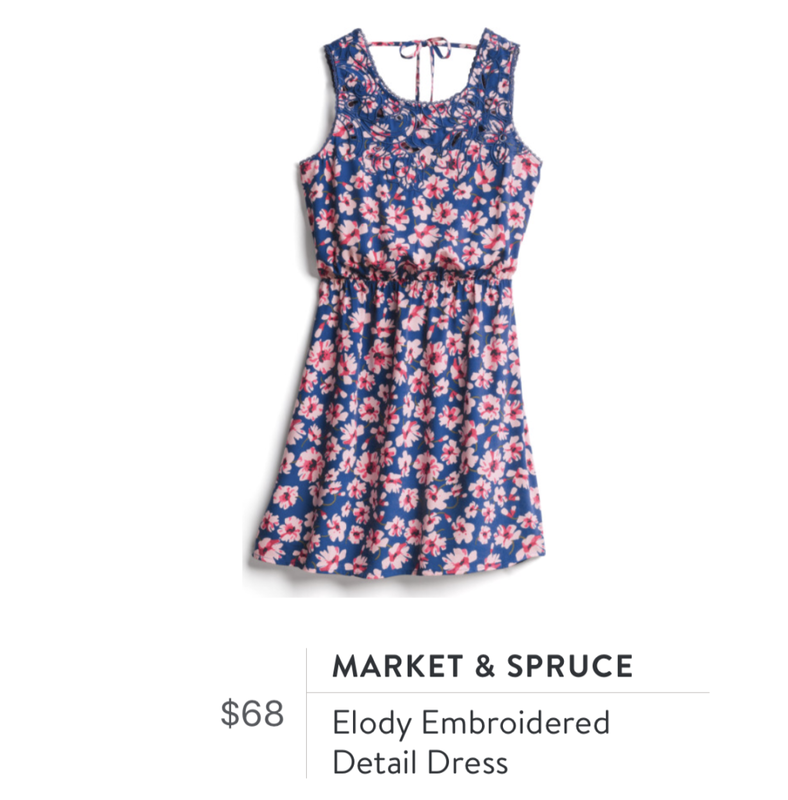 While the print was cute and floral, it wasn’t anything special in my mind. Certainly not worth over $90. It was a bit tight around my chest so it was a no go for sizing already. Even if this was cheaper, I don’t think I would have kept it. Back to FDF it went! You won’t see these pictured anywhere, but the earrings they paired with these outfits are three little flowers bunched together. I kept them without trying them on. I wish I had tried them on first since one of the bars for the earrings was bent out of shape and I had to play around with it to get it straight again. But, all good. They were cheap enough, cute, and seemed like an item I’d use multiple times so I decided to keep these as well. 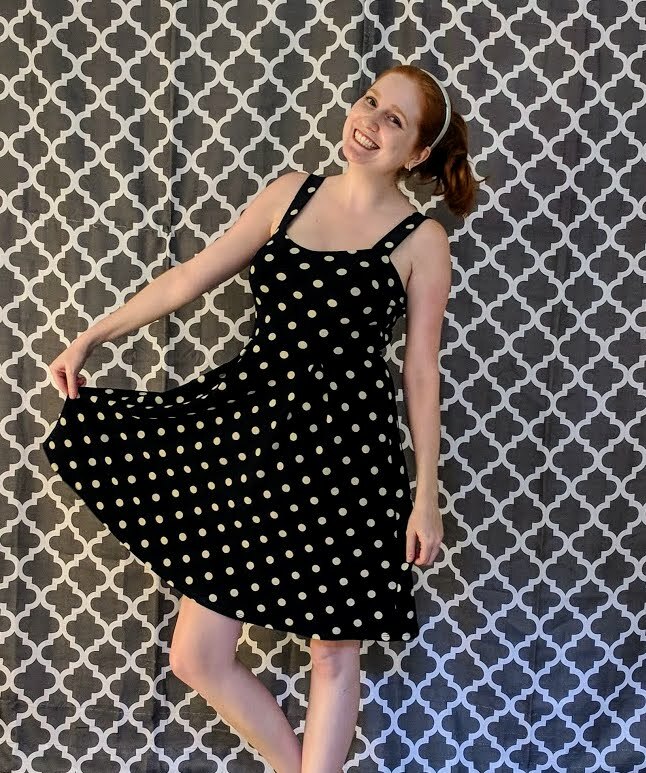 I’m a tank top loving girl, and if I can find one that’s dressy and fun that’s even better since I tend to just rock the plain old cotton tanks from Target. 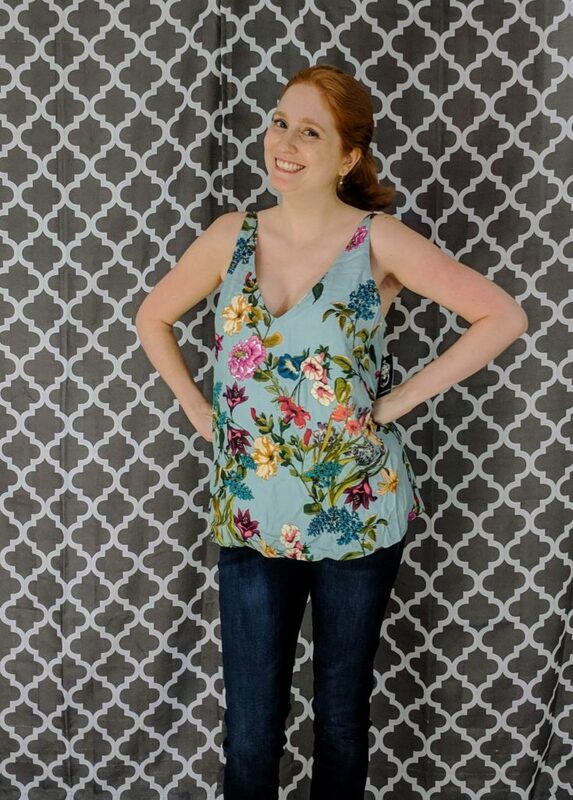 I loved the coloring and print of this top, but the fit was no bueno. It was gaping around the armpits, and was overall too large. If was a smaller size, and not so expensive ($140 for a TANK TOP!?) I might have kept it, but alas back it went. I don’t have a lot of basic plain long sleeve tops. 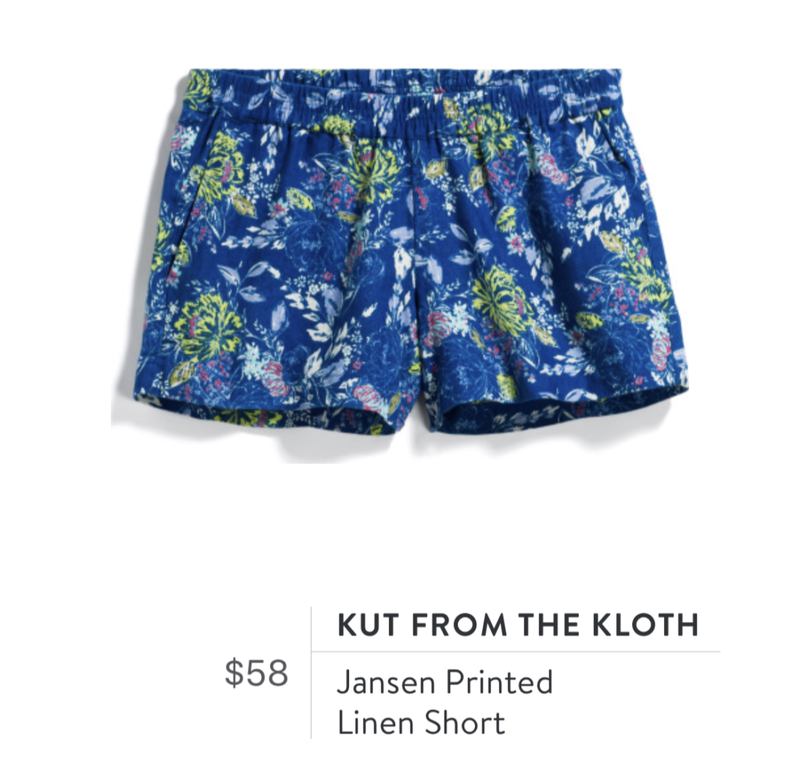 While this one wasn’t anything special, and I wouldn’t call it high fashion, it fit a bill I didn’t know I was looking for. It’s always good to have a plain solid color long sleeve top and the price was cheap enough where I decided to just keep it. 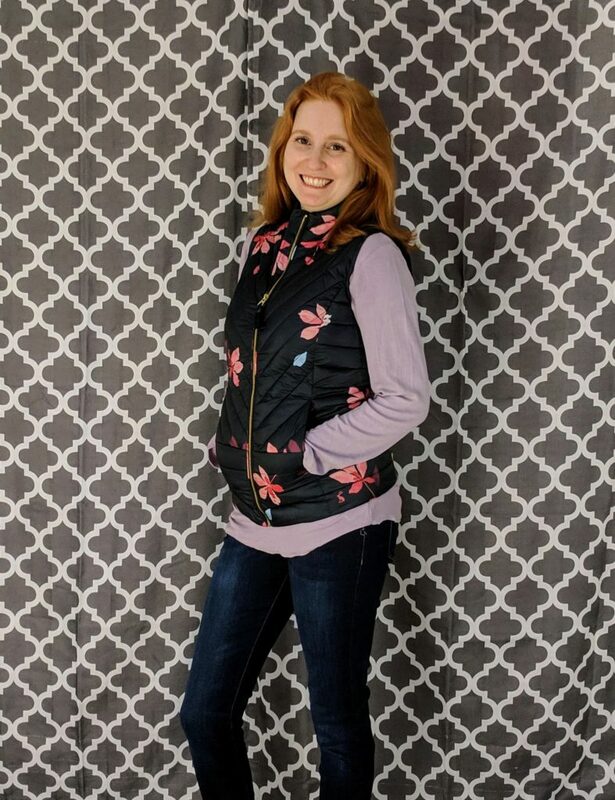 I also have two puffy vests in my closet so I figure I can just copy what the stylist suggested and use what I already have and pair that with this top. 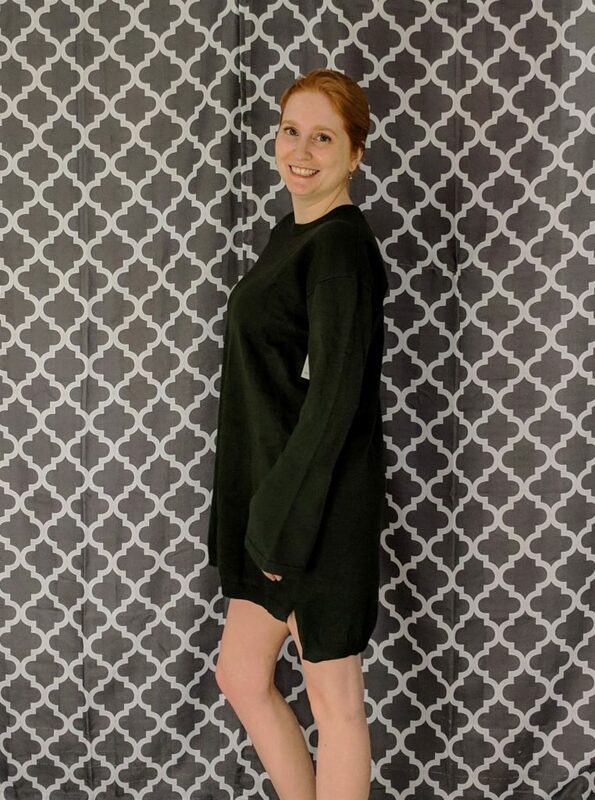 Sweater dresses can be cute and comfy. This is an interesting twist on the classic, with bell like sleeves, a high-low cut, and an oversized look. I love dark greens on my complection and with my hair color, so I immediately liked that. 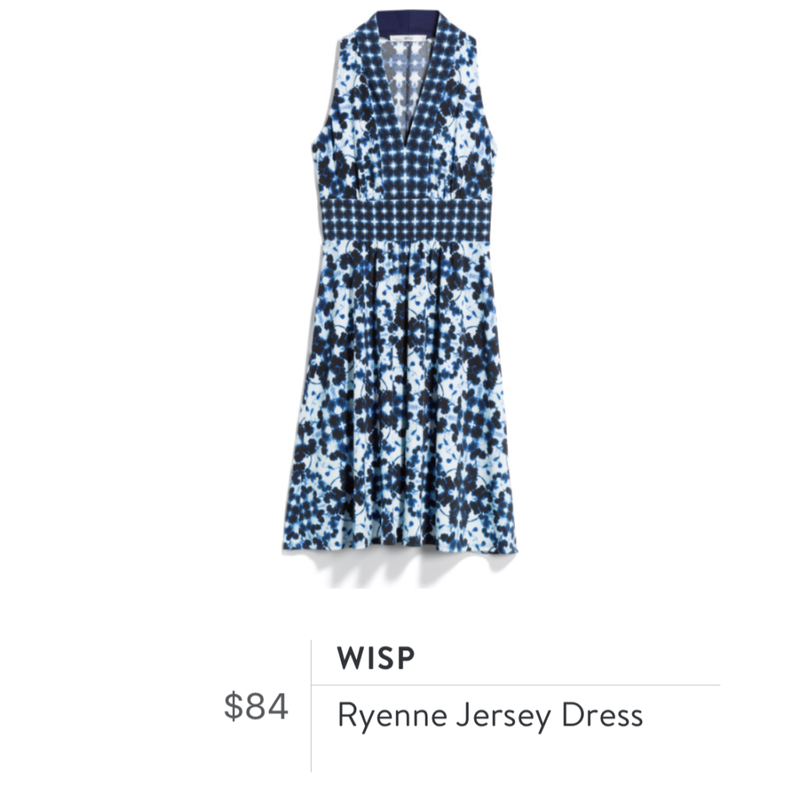 I wasn’t so sure with the cut and style of the dress, but I think it would be nice for a cozy weekend where I don’t mind wearing an oversized sweater/dress. 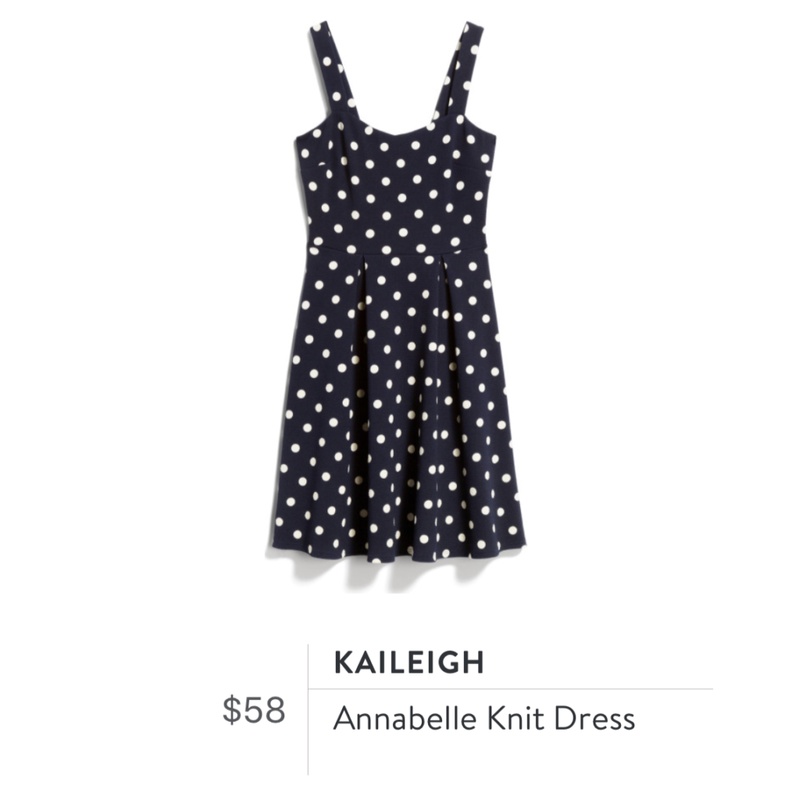 It is pretty short though, so I’ll probably pair this with a fun pair of tights or some black leggings. 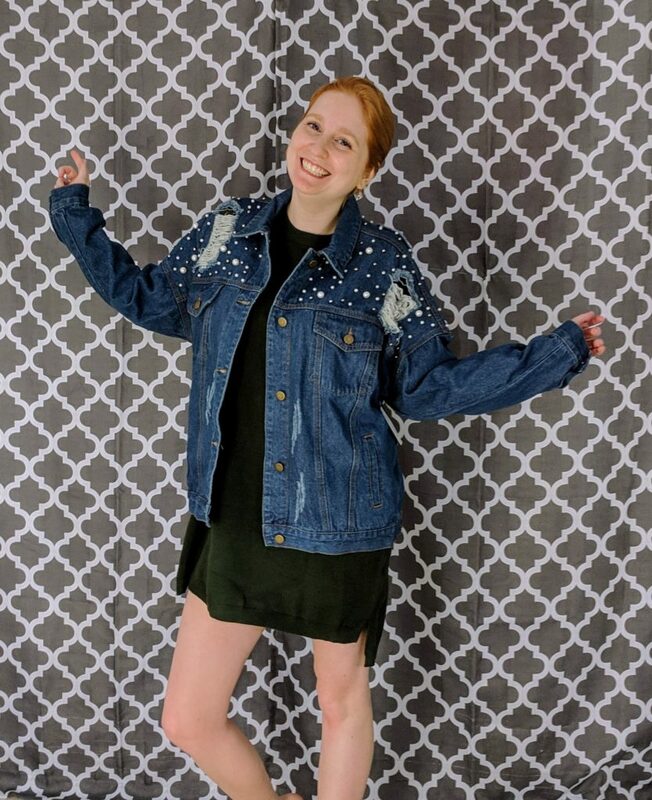 I know as part of my profile I mentioned I didn’t like distressed jeans, so it was a little comical to get a jean jacket that couldn’t have been more distressed. I’m not into the look of holes in clothes, particularly jackets. This jacket is a doozy. The gigantic pearls also really add to the uniqueness of this jacket. 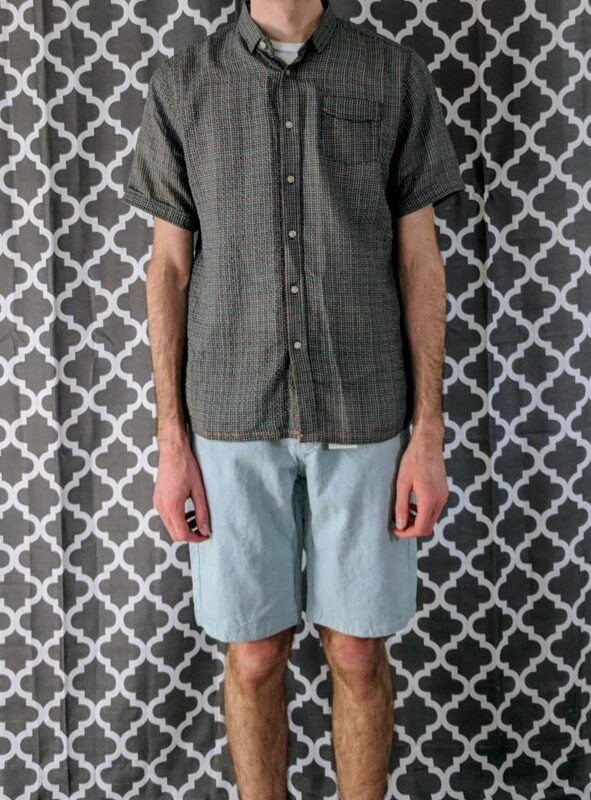 According to my stylist, this look is really in right now. I think I’ll pass. 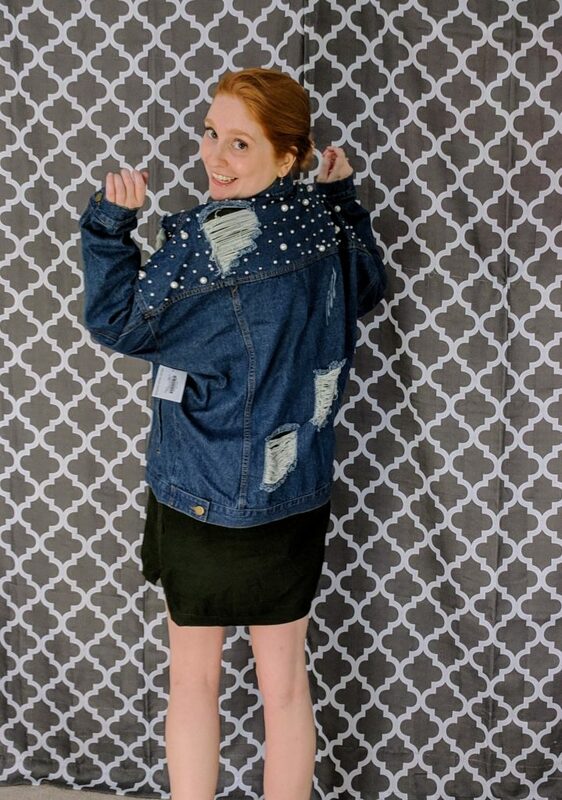 Oversized jean jackets with crazy embellishment and distressing might be for some celebrities, but not for me. 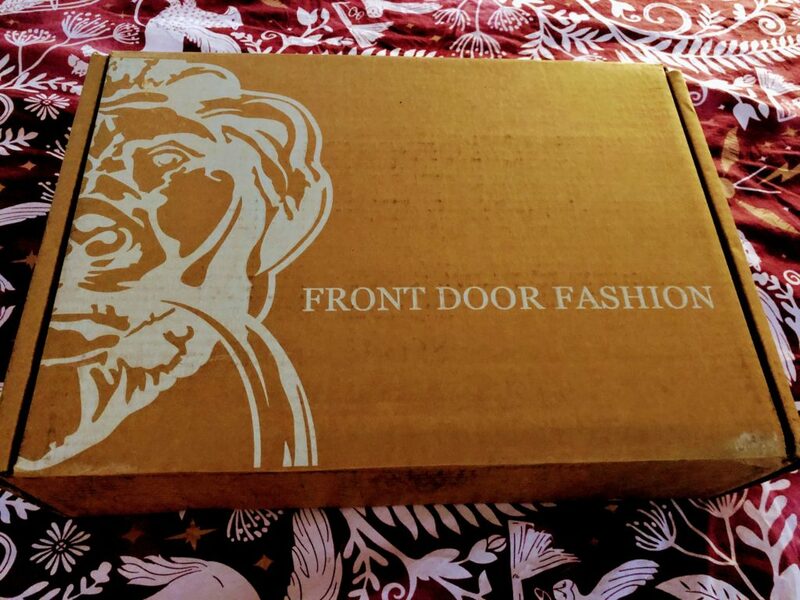 Now for those of you wondering about how Front Door Fashion compares to Stitch Fix, I’ve written out some of the key differences below in case your on the fence about one or both of the services. Checking out is an odd experience with FDF. There are no images on the site, the check out process is very odd where you just have one open response box to write any feedback or thoughts, and that’s that. You have to do the actual purchasing and selecting of items on the sheet of paper that’s placed in your box. I was shocked that this was how they did things and that you didn’t even get to keep the paper with all the items and styling tips listed, but that was ultimately how you “checked” out what you were keeping and sending back. 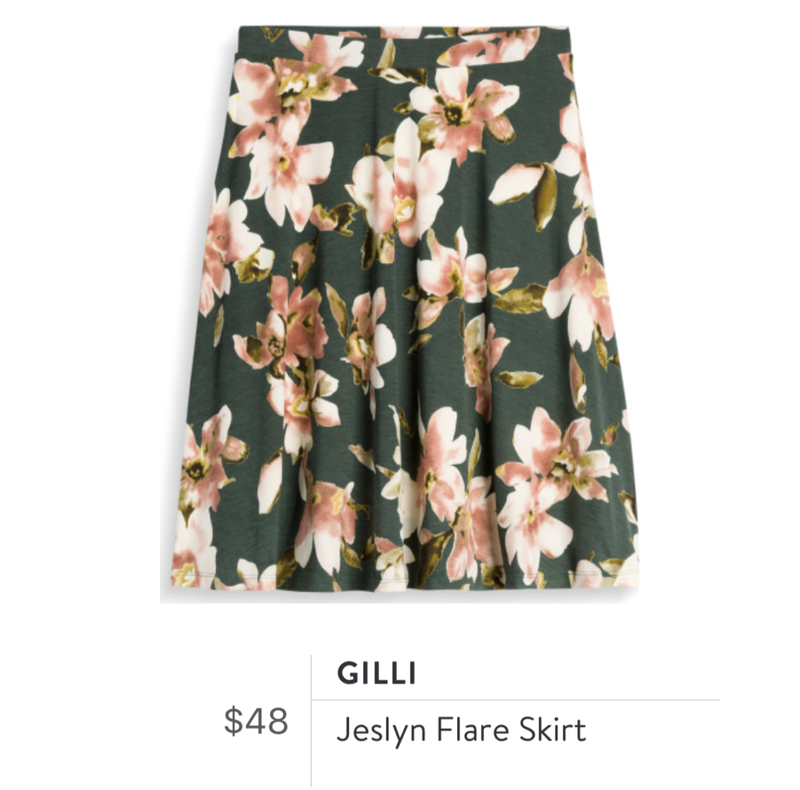 Stitch Fix’s experience is a lot better where you leave feedback about each item, and each item is pictured so you can easily see what you’re reviewing. 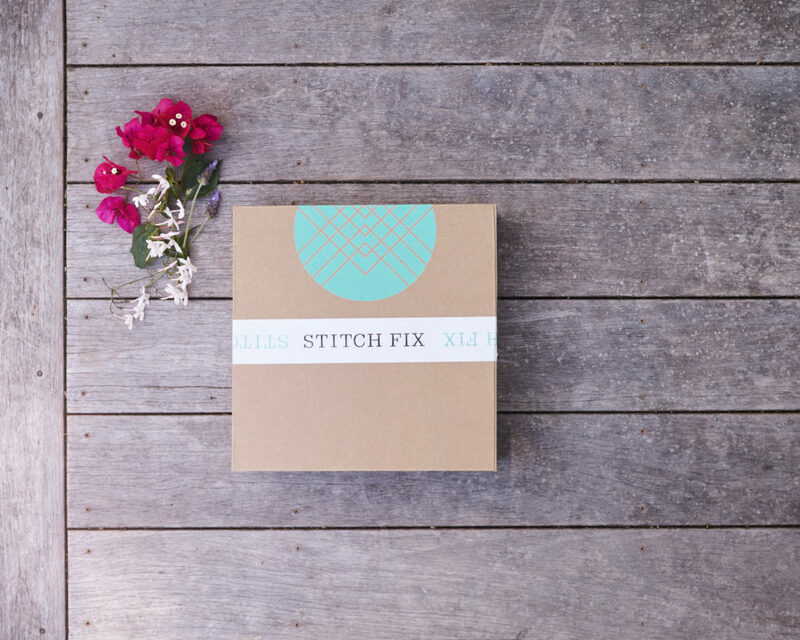 Stitch Fix has a $20 styling fee each time you request a Fix. With FDF there was no “official” up front styling fee, you just requested a box, and then $100 was taken from your account and then that would be credited towards whatever you purchase, or if you kept nothing you’re supposedly able to get that deposit back. 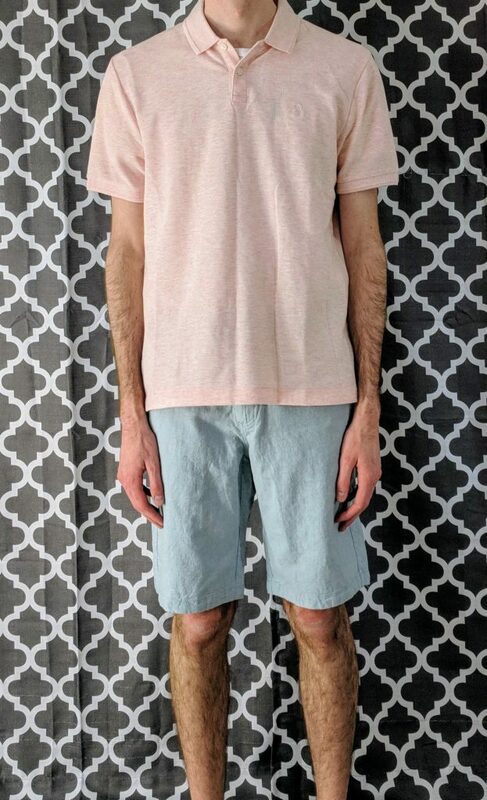 Stitch Fix doesn’t give you back the styling fee. 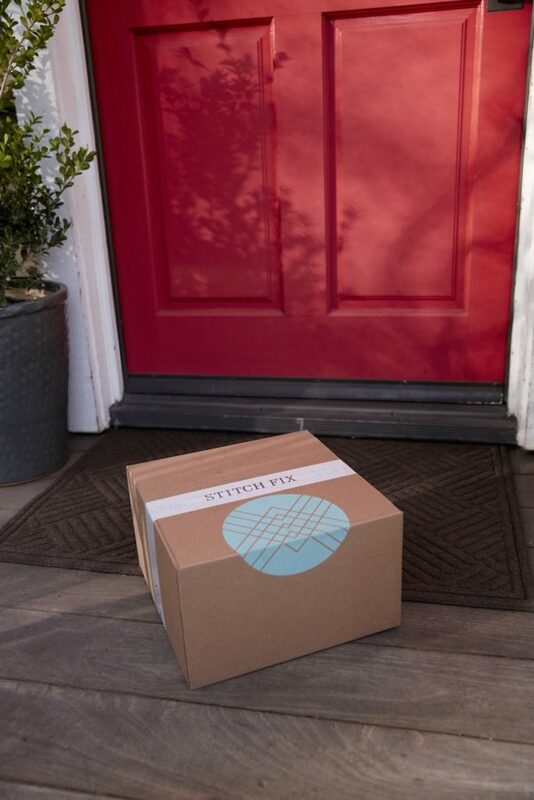 FDF seems to have more time availability to get your box worked on right away, instead of choosing a date weeks/months in advance for Stitch Fix. I expected FDF to be a bit quicker than they were based on how aggressive they were, but eventually my box came a week or two later. 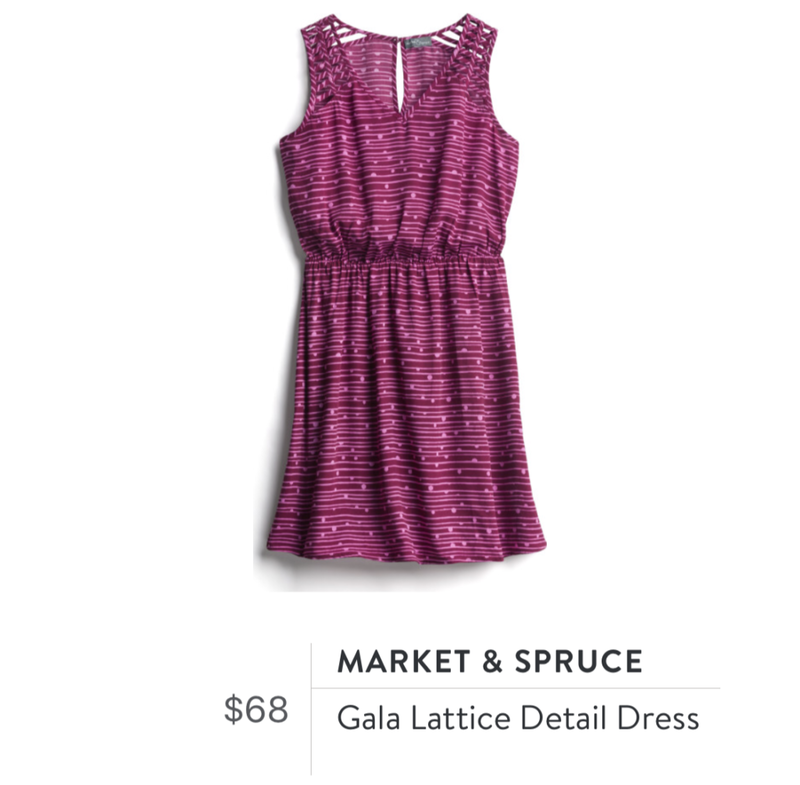 I really prefer the Stitch Fix model here, because then I can choose a date that I know I’ll be around for. While for FDF, if my box came when I was away, I was afraid I’d get charged their late fees since I could potentially miss the 5 day window. You could call Front Door Fashion stylists “pushy.” They’ll call you, text you, and email you. It doesn’t stop once you’ve purchased a box either. 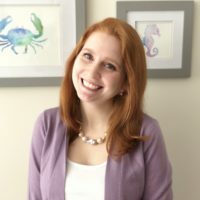 They want to keep getting your business so there’s a lot of reminder emails and promotional content sent your way about “deals” and “sales.” Stitch Fix on the other hand never bothers me to order a box, or doesn’t do it in a pushy way, it’s more of a marketing email showing you some trends for that season. No one’s ever called me either. 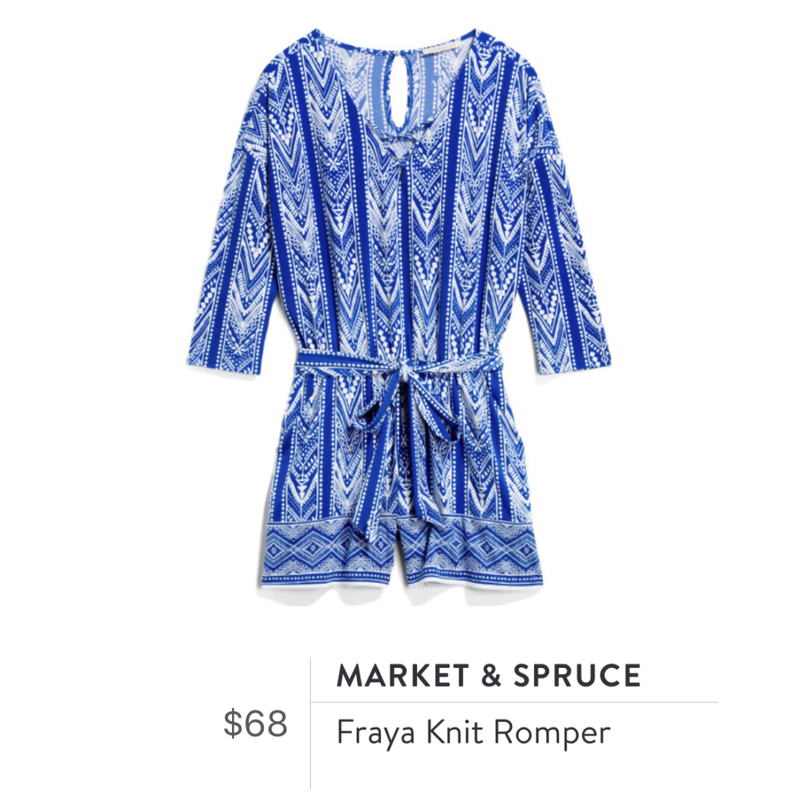 FDF pricing starts much higher than Stitch Fix. Going into the door you need to expect these items will probably cost serious cash. I was hesitant about this, but chose the cheapest category for every item since I knew I’d be getting more items than I usually get from a clothing box. 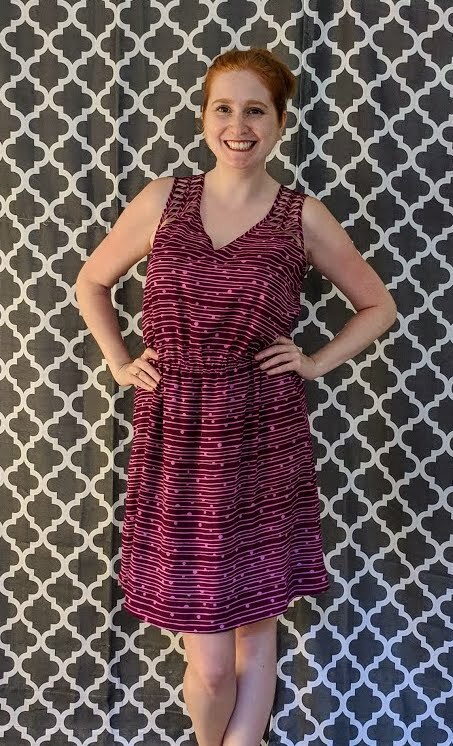 With FDF you get a lot of items, usually 3-5 outfits, which means you get a LOT of pieces from tops, bottoms, and jewelry. You can sometimes create multiple looks by combining pieces from the grouped outfits you’ve been given. 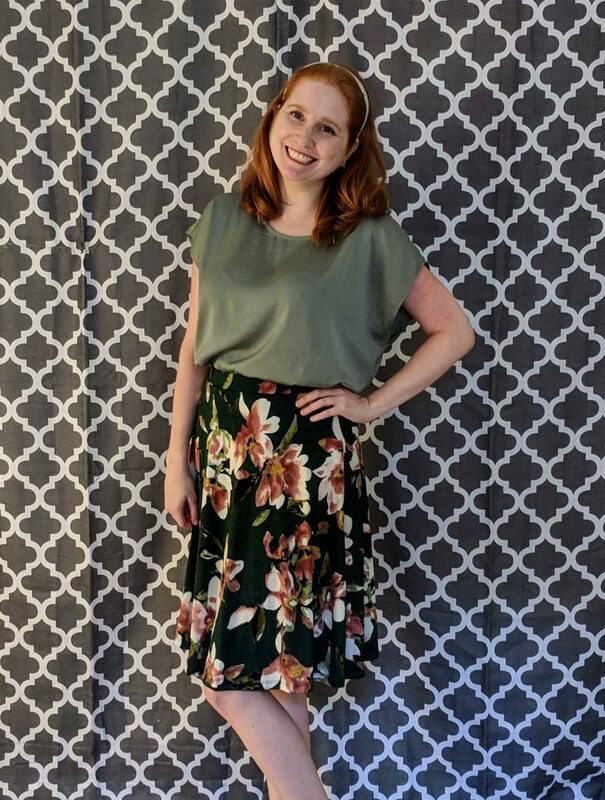 Stitch Fix on the other hand sends a max of 5 items, and they don’t always go together to create an outfit unless that’s what you explicitly want and ask for. 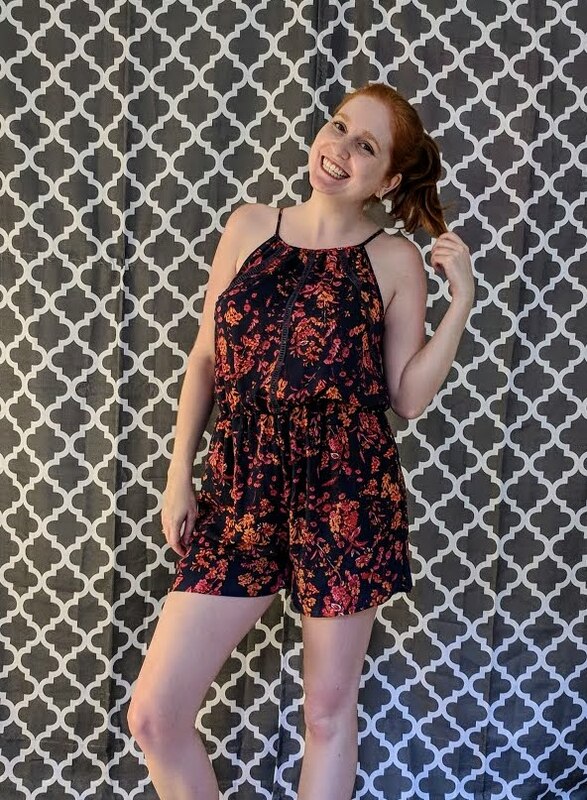 I’d say if you want a service that provides multiple and full outfits from tops, bottoms, and accessories and aren’t afraid to spend a lot of money, Front Door Fashion may be for you. 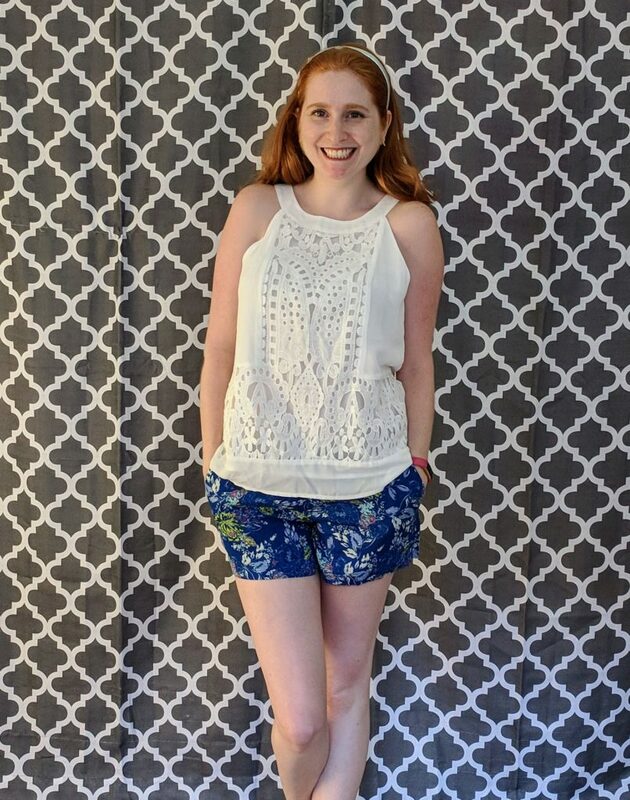 If you’re looking more for individual pieces and a variety of items, Stitch Fix is better in that regard, and you can always ask for something specific, be it an outfit where all 5 items could go towards that one look, or some pieces that you can use together. 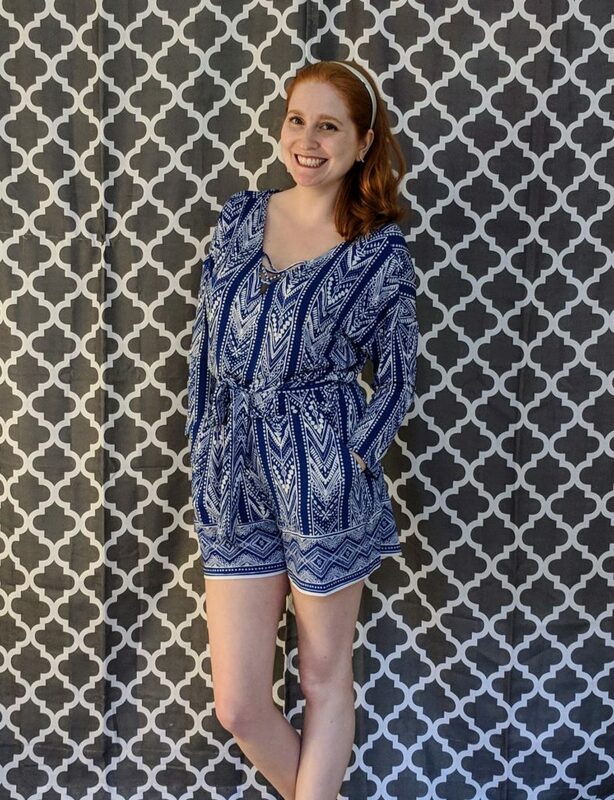 For now, Stitch Fix still has my loyalty, and I’ll continue to get the occasional box from them since I think their selection is more geared toward me, and they understand my fashion a bit more. Granted I only tried Front Door Fashion once, I don’t think some of the feedback and style icons I shared really fit with some of the pieces I received. Both companies are super fun to try out and it might be worth switching back and forth now and then to see what new surprises they have in store.